LOS ANGELES—Heading into the final game of the NBA’s regular season, Lakers coach Mike D’Antoni told reporters Wednesday that he is thrilled to finally have the opportunity to actually coach the Los Angeles Lakers. 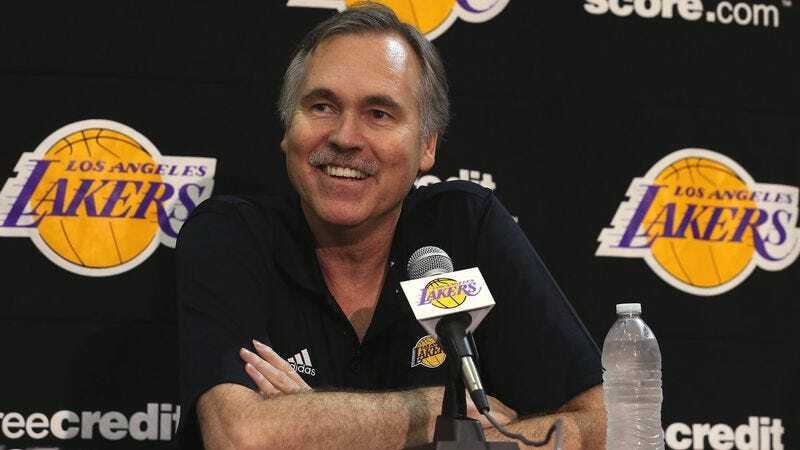 “We have the right personnel in place now to allow me to install my system of offense, and I honestly couldn’t be happier with the roster at the moment,” said D’Antoni, adding that he’s been waiting a long time to be in charge of the Lakers basketball team and couldn’t be more excited to finally get started. “I know it’s late in the season, but I’m just happy that I can do what I was actually brought here to do.” Reached for comment, Lakers GM Mitch Kupchak revealed that D’Antoni will have approximately nine months before the team reevaluates his position as head coach.